Carrots can be cooked in mere minutes in a pressure cooker. This recipe makes it quick and easy to serve up a delicious side dish for weeknight dinners and also holidays like Easter and Thanksgiving. Save on valuable stovetop space during holiday meal prep by using the MultiPot pressure cooker for side dishes like this one. Plus, it's ready in 30 minutes! Finishing with the honey glaze allows you to control just how much sweetness to serve with your side dish. Whisk water and 1 tablespoon honey together in a small bowl; pour into the pot of a pressure cooker. Arrange carrots into the liquid in the pot. 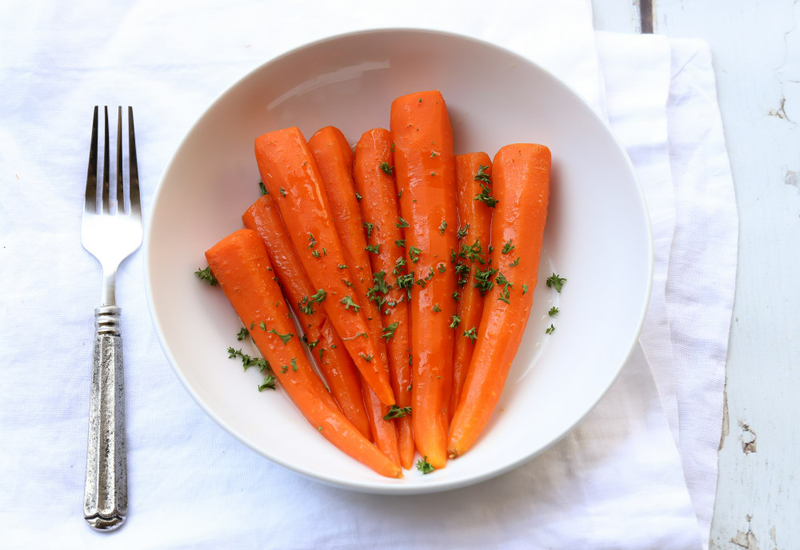 Remove carrots to a serving dish. Set pressure cooker to Sauté. Stir remaining 2 tablespoons honey and the brown sugar with the liquid in the pot; cook, stirring frequently, until thickened and lightly golden in color, 3 to 4 minutes. Spoon honey glaze over carrots; season with salt and pepper to serve. If honey is a bit too sweet for your palate, try using orange juice instead. You get some natural sugar and a nice citrus hue to the flavor. You can also use the steamer rack to steam the carrots above the liquid, rather than cooking in the liquid. May be a little more crisp, but will not absorb as much of the sweetness. Per Serving: 150 calories; 6g fat; 25.2g carbohydrates; 1g protein; 15mg cholesterol; 127mg sodium. Hello...When do you add the butter??? Used orange juice instead of honey, definitely think it would have been too sweet. Loved the citrus notes, and how incredibly easy to make. I have a baby who loves carrots so now that I know how easy it is to make in the pressure cooker I’ll be making it all the time. I used baby carrots instead of whole carrots. I really like the honey glaze. I was expecting it to be thicker, but it wasn’t which actually worked out better. I'm a big fan of carrots so this recipe is saved in my favorites. I added some sliced almonds to top the carrots and I paired them with a nice med rare prime rib. Where does the butter get added in??? ?